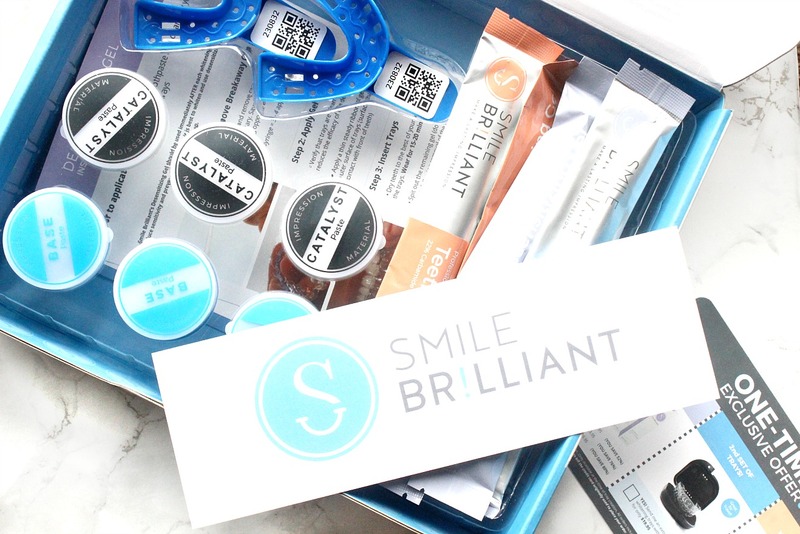 Smile Brilliant Teeth Whitening Experience & Treat! Hello everyone! I am back with a super exciting post today, which has been in the works for a long while now. I was offered the opportunity to try an exciting teeth whitening kit * at the end of last year, and since I had seen a YouTuber I watch now and again review it, I quickly agreed. My teeth were never SUPER yellow, but I am an avid latte drinker and so they can get pretty stained and not as bright as I would like at times. 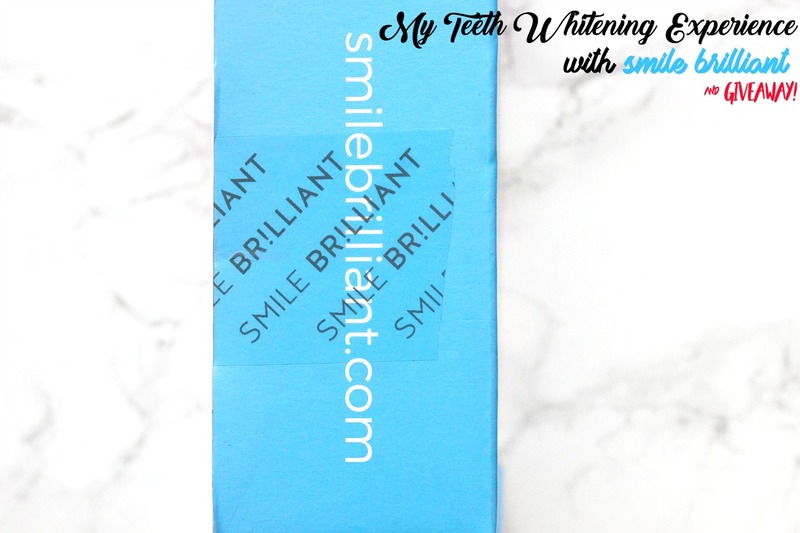 I have previously tried the teeth whitening strips, but the results were very uneven because my teeth aren't perfectly straight, so that was kind of a big fail! Getting back to the brand I'm reviewing today - Smile Brilliant. I had seen the impressive results from that review, so I was super excited to try it out myself - and to cut straight to the chase, it is definitely a system that delivers results! This is probably one of the most thorough teeth whitening systems I have ever seen, and very professional too. This is because you literally have to send impressions of your teeth over to their lab, in order for them to create you trays which fit exactly to your teeth shape. This is also not one of those which uses a blue light. As you can see, the box comes chocoblock full of things and you have enough whitening gel in here to last you for months and months. It is also very straight forwards to use, as they include an instruction guide for both creating the impression, as well as a guide for applying the gel. I didn't find any need to check their website, because all the information I could ever need was included in the box, which is so thorough and helpful. In the box you get sent 3 sets of impression material - which is the catalyst and the base paste. I really appreciated that they sent three and not just two, because I messed up the process the first time around! Having said that, the steps to create the impressions were made very clear, as you can see from the instructions booklet above, so I felt confident enough to create them without having to watch a video. You mix up the catalyst and base paste and you'll know when it's all mixed up properly, because the putty will be a solid blue colour without any streaks. Then you carefully press the mixture into the tray, evenly distribute it and press your teeth into it. It really is as simple as that. You then pop both trays into the envelope and send it off to the labs. 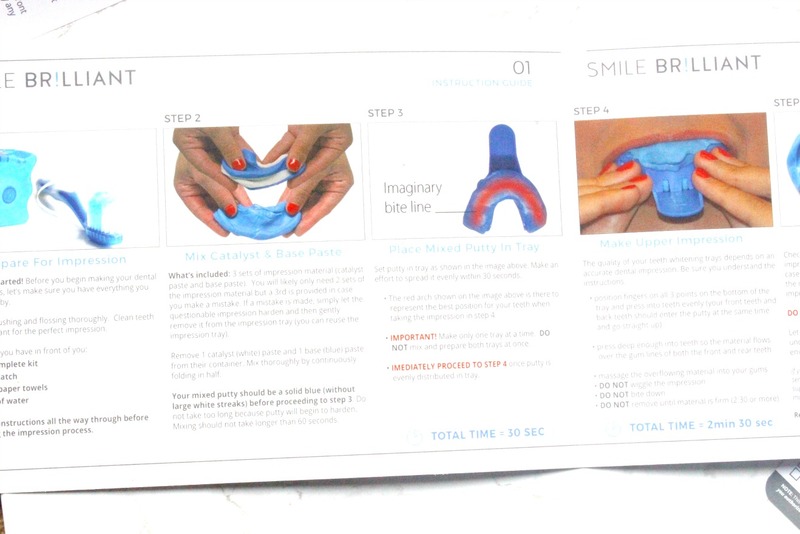 Within a few days they receive your trays, create your plastic impressions and send it back. Obviously because i'm in the U.K this process took at least 2.5-3 weeks, but to think it had been all the way to L.A and back was pretty cool! Believe it or not, this is also as simple as the whole impressions process - if not even simpler! You get a bunch of whitening gel tubs and desentitising gel tubes. These also come with their own informative leaflet explaining exactly how to use them, whitening best practices and any other extra information. Basically you open up a whitening gel, remove the breakaway cap and carefully squeeze a thin layer of gel to the front part of the trays. You have to ensure the trays are dry before you do this and also you need to dry your teeth as much as is humanly possible haha! Then you insert the tray over your teeth and keep it in for around 45 minutes for your first use. This time will gradually increase as you keep whitening your teeth, and honestly it is as simple as that! You keep them in and go about whatever you were doing - for me that's usually writing up a lesson plan. Then when you've kept them in for the desired time, you head over to the washroom, take them out and rinse them and then brush your teeth with toothpase. Then you repeat the same process of applying the gel, but this time make sure its the desensitising gel - which works soooo well! This gel you keep in for 20 minutes max and it really helps with getting your teeth used to the whitening process. I have not experienced any pain through using smile brilliant, however there was a point in time when my teeth felt extra sensitive. This was because I thought I could be super brave and keep them in for 2.5 hours, which was too much for me at the time. So I'd advise you to increase the time you keep the whitening gel on for gradually! And the moment you've all been waiting for...does it work or naah? YES, yes it does work and I was so pleasantly surprised to see it worked from the first use. For best whitening results I recommend repeating the process 3/4 times a week, for a couple of weeks, and you will see such a great improvement in the stains and yellowness of your teeth. For the first time I felt confident smiling and showing my teeth after using this consistently for a month, because my smile was so bright! I've always disliked my teeth a little, but just knowing that they're whiter and brighter makes me feel a LOT better about them. P.S I don't love having such a close up of my very imperfect teeth, but I hope you can see the results so far! I think with a few more consistent uses the staining at the top will be lifted even more and by May half term I shall have another update photo! They also have different kits available, if you have heavy staining, if you have more sensitive teeth etc. Which I think is so inclusive and thorough again, which is another reason why I'm so behind this brand. I think this is one of the best at home teeth whitening kits on the market, because you get enough gels to last you for ages. Seriously one tube of whitening gel lasted me 5X! Which is fantastic because I have lots left, and can look forwards to white teeth for a long time. I love how I can top up the whiteness at home without needing to pay anything extra, or going out to a dentist or clinic. 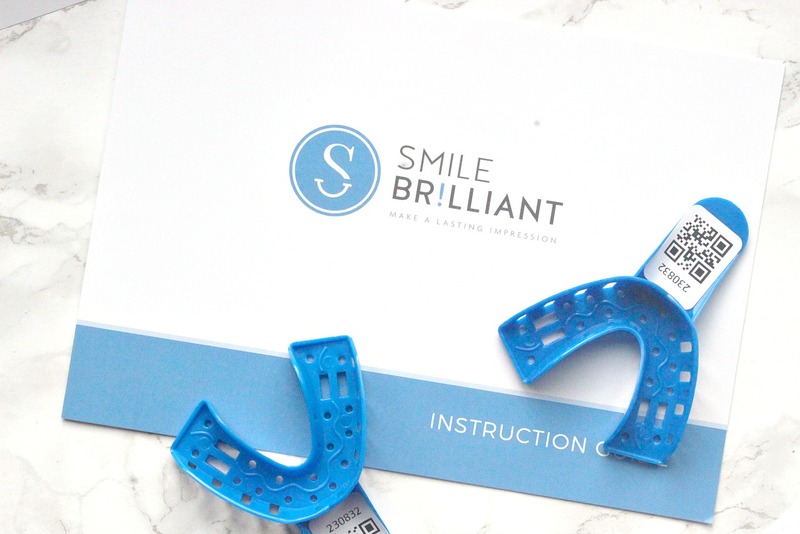 It takes a lot of the hassle and expense out of having white teeth, and if you don't have thousands to splash on your smile, I highly recommend you get yourself a smile brilliant kit. And now for the TREAT! I am SUPER excited to tell you that they are kindly giving away a whitening kit for one of my lovely readers, yaaay! Click here for your chance to win a kit, you will need to enter your name and e-mail address, and the winner will be selected at random in exactly two weeks. Goodluck - this has to be the most exciting giveaway I've ever had the chance to run for my readers, and the fact that one of you gets to feel more confident about your smile makes me so happy. And very grateful to smilebrilliant! ❤️ AND if that wasn't enough, you can get 10% off your order using the code theblushinggiraffe. This is an affiliate code, which means I'll get a small amount of money, at no extra cost to yourself - of course you don't have to use it...but money off is always a good thing to me haha. 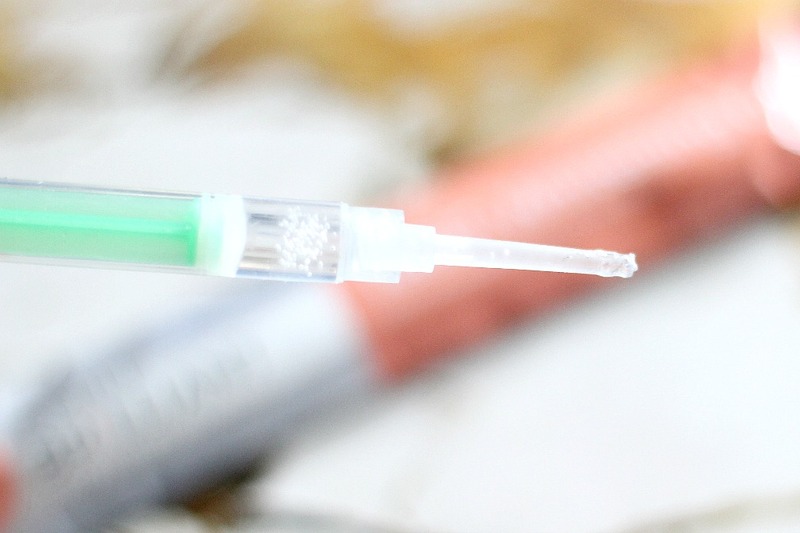 It's worth having a read of this article called 7 things to know before buying teeth whitening, as it goes into detail about more of the scientific side of things too. This kit was sent to me, but I will be repurchasing the whitening syringes (which start at a really reasonable price) myself, because its a system that works and it's all done from the comfort of my home for a very reasonable price ☺️. Have you tried at home teeth whitening before?